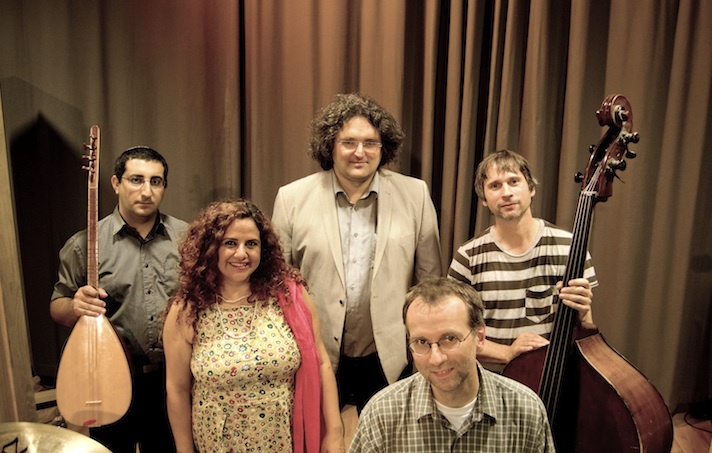 Traditional Turkish-Jewish and Kurdish-Jewish music intertwines with modern jazz in a unique musical cooperation. Almost unbeknownst to Europe there exists a rich Turkish Jewish and Kurdish Jewish musical tradition. These ancient musical forms have a very unique timbre coming from a fruitful mixture which has grown over centuries in the osman region. Today unfortunately we often assume a fundamental contradiction between Jewish and Islamic culture and perceive both cultures as poles deeply caught in enmity – a perception caused and fuelled by political conflicts. Nothing couldbe more wrong: especially in Israel today many such “oriental” jewish ´traditions which once immigrated into the Country and which are a living testimony of a Jewish-Islamic cultural symbiosis, are being cherished or even newly discovered. There is almost a “wave” of interest in such Music, given also its impact on the cultural identity of many Israelis. Already in 2012 there has been a successful cooperation of the Max Doehlemann Jazz trio from Berlin with the two israeli musicians, Hadass Pal Yarden and Yaniv Ovadia – initiated by the Jerusalem institution Kehillot Sharot and its director Yossi Ohana. The formation had its successful debut in the Jewish Museum in Berlin in front of an audience of more than 600 enthusiastic listeners. Hadass’ musical home is the Turkish Jewish musical tradition. She studied classical Turkish music at the conservatory in Istanbul. Yaniv is deeply rooted in the Kurdish tradition. Both artists are regulary performing in Israel but are also active as cantors. The CD has the title “azur”. The rich oriental maqam tonality influences the jazz musicians and is embedded by them into their harmony. Inner relations between Blue Note and oriental tonality are explored. The musicians are joyously passing rhythmical impulses toward each other. They also present the traditional songs in their original form and the Jazz Trio improvises on Jewish melodies.